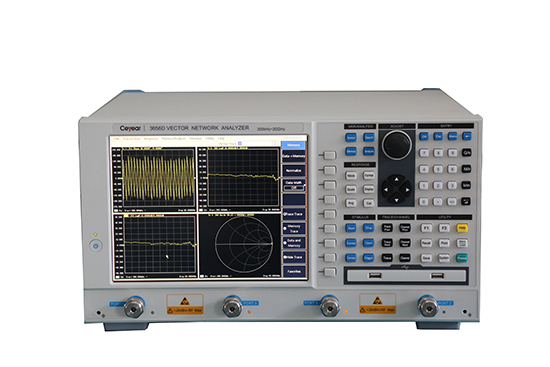 3656A/B/D vector network analyzer is applicable to fields of radio communications, cable TV, teaching and automotive electronics etc. It can be used for performance measurement of RF components such as filter, amplifier, antenna, cable, and cable television sub connectors etc. It adopts Windows operating system, and has functions of error calibration, time domain and fixture simulator. It supports multiple display formats such as logarithmic amplitude, linear amplitude, standing wave, phase, group delay, Smith chart and polar coordinates etc. ; It provides multiple calibration types including frequency response, single port, response isolation, enhanced response and full dual-port, rapid SOLT calibration and electrical calibration; It is capable of multi-channel and multi-window display; It is designed with USB interface, LAN interface, GPIB interface and VGA interface. It can rapidly and accurately measure the amplitude, phase and group delay characteristics of the DUT S-parameter, with efficient and powerful error correction capability. With dynamic range up to 125dB (IFBW=10Hz), 3656A/B/D is capable of accurate measurement on devices with high rejection ratio. The analyzer can conduct time-domain measurement on DUT via time-domain software so as to comprehensively test the performance indicators of DUT, such as cable fault location and length measurement.